Forget the cinematography, lighting and production/art design credits on Dario Argento films. His work shows how much these elements can be the result of the director, and in Dario's case, it's obvious it's all him. His genius in those areas is so pronounced that even in films like Lamberto Bava's Demons or Michael Soavi's The Sect, where Argento only gets a co-producer and co-writer credit, it's obvious that he also had a hand in cinematography, lighting and production/art design. It's not news that all of Argento's films are pleasant to look at. Suspiria is usually cited as the prime example of this. The thing that many casual Argento fans don't know, however, is that Inferno is just as amazing as Suspiria for visual content-even more so at times. Unlike Suspiria, however, which had a decent, but not great script, Inferno shows that Argento, at least if left unchecked, can create an utter disaster story-wise. The plot is a complete mess. I may be giving spoilers here, but arguably, since Argento creates little to no suspense, or even a reason to remain very interested in the story, it won't matter. You should definitely watch Inferno, but you should watch it because every frame is worthy of a place in an art gallery. At times near what should have been the climax, I gave up all hope of caring about the story and started watching Inferno as a connected series of moving paintings. In the most condensed version, it's something like this: A woman in New York City picks up a book called "The Three Mothers." The book freaks her out and she thinks it references her. There is some nonsense about finding three keys (this bit sounded unintentionally funny to me, but possibly just because I'm a huge Todd Rundgren fan and it reminded me of Singring and the Glass Guitar from Utopia's Ra album), and one is supposed to be in a cellar. She heads to a basement and finds a hole in the floor filled with water. She drops in a pin in the hole, dives in and discovers underwater rooms. Next, a Fulci corpse floats into her. In the meantime, she's written a letter about the book to her brother. Her brother sees a women and a cat who are left as a dangling thread later, plus some other woman who might have the hots for him. The second woman reads the letter, takes a cab to the library and looks for the Three Mothers book. She runs into an evil alchemist who wants the book so bad he almost boils her head in a vat. Later at her apartment, a standard Argento killer (someone wearing gloves and obsessing over objects) gets rid of her and the stranger she invited into her place. Now, it might seem like this is all heading somewhere, but it actually becomes more disjointed as it progresses. There are some witchcraft kind of people living in the first woman's building, who might serve human meat to cats. There's an old guy from the book living beneath the building, and his nurse is really death, etc. It all makes little sense, and I doubt repeated viewings will help. But you're not going to watch Inferno for its amazing plot. You're watching to look at how pretty it is. Cleverly, Inferno begins normally enough-at least until the first woman heads into the underwater rooms. Aside from the beauty of the girl (and Argento makes sure she's wearing white for her wet "t-shirt" contest preparation; plus she looks great barefoot) this sequence is incredibly poetic and atmospheric. The corpse at the end actually kind of ruins the mood a bit, because all creepiness and tension here come from how long she's underwater, plus her disorientation. The corpse seems gratuitous. After she heads out of the water, suddenly Argento takes us into one of his surreal sets, and the lighting and cinematography began a very long, climactic build until it seems like Argento wants to abandon everything but placing the characters in a world that's like Mark Rothko meets Piet Mondrian meets Frank Lloyd Wright using pigments mixed by Argento-his usual bold primary colors (especially blues and reds) with gradations of darker, more complex tones thrown in for contrast. Every scene is lit meticulously and perfectly, and the sets discard logic in favor of design to Argento's advantage. As for the score, I've always loved Emerson, Lake and Palmer as much as the next guy -- more so, probably -- but Keith Emerson's music, as nice as it might be in isolation, simply doesn't work here. For one, it seems like he simply wrote a few songs, rather than incidental music. There are long stretches without any music, then all of a sudden it's like your neighbors put on Tarkus at full volume. The music to accompany the cab ride to the library removes suspense and atmosphere rather than enhances it as does the overly bombastic music for the main woman's chase sequence. Sorry Keith. 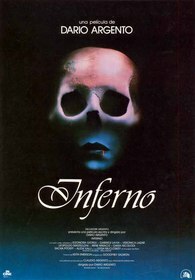 A must see for Argento fans, and recommended viewing for the rest of us, especially film students looking for a fresh visual approach, Inferno would work just as well with the sound off and something like Brian Eno on the stereo. I can't imagine most people thinking it's scary-it's almost too pretty for that-although "creepy" works as a description every now and then. Just as often, Inferno can be unintentionally funny, as well, as in the flying cats scene, the dialogue about smelling, or the nurse's transformation into the grim reaper. 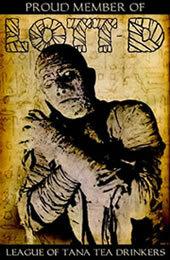 Although it is a masterpiece in some respects, in absence of Argento's painterly touch, the story is mediocre at best. Part two of a trilogy about the Three Mothers (Suspiria being the first part). It was long believed the trilogy would be incomplete, until Argento announced that he would be making the third part, appropriately titled The Third Mother, for release in 2007.